At Spinsoft we have recently completed our analysis of more than 2,600 businesses in Bayswater and Boronia. The analysis took several months to complete and unfortunately shows that a large percentage of businesses aren't investing in their online marketing and business websites. 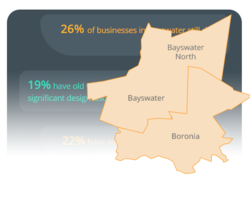 Bayswater features a large business district, however percentage wise we found that 47% of businesses either don't have a website, or have a website with significant issues (very old, poor usability, broken links). Boronia fared only slightly better with 35% of businesses that have no website or a website with significant issues. Our analysis was completed over several months with a lot of time and effort (each business was reviewed manually). We are hoping to perform an analysis of more suburbs in the future.